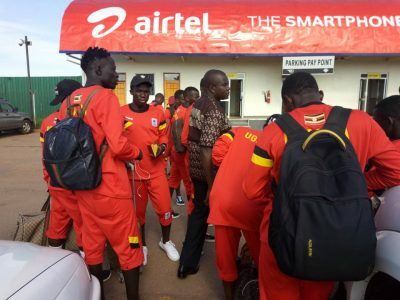 The Uganda U20 National Team, the Hippos have this afternoon departed for South Sudan where they will be playing the return leg of the U20 AFCON qualifiers. The Hippos are very much high in spirits after the 5-1 demolition of their South Sudan counter parts at the start of the month. A squad of 18 players will be representing the country in a match that is seen by many as a done deal but head coach Matia Lule is not getting carried away. “Yes we won by a comfortable scoreline in the first leg but the job is not yet done, said Lule before departure. “When you look at how they (played) especially in the first half in the first leg, i think you will know that they are very much still in it. “I have told my players not to get complacent in any way and i hope the message came across clearly. The Hippos have been undertaking intensive training since Monday and will be hoping all goes in their favour on Saturday. They will be without the suspended defender Mustapha Kiiza who is serving a two game ban after he was sent off in the first game. Kiiza will also be absent in the first leg come the next phase of qualification but Lule says it is not a problem. “We have a number of Kiiza’s in Uganda and i know we will be able to cope minus him. “He is one of a number of players and we can’t seat done and cry over his absence. Kiiza has the highest number of assists in the league this season (11). Saidi Keni, Otim Denis, Willa Paul, Geoffrey Wasswa, Mustafa Mujuzi, Abubakar Kasule Muhammad, Julius Poloto, Frank Tumwesigye, Steven Mukwala, Saddam Masereka, Allan Okello, Fred Okot, Ssekyanzi Faisal, Asiku Bashir, Joshua Okiror, Kitabalwa Robert, Achai Hebert, Ivan Eyamu.